Leadership: Time for risk-taking to return? Ranadive: "Fail fast -- if doesn't work, move quickly to something else." DALIAN, China (CNN) -- Is risk-taking back in vogue? 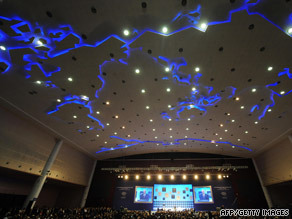 "Summer Davos" in Dalian, China, saw business leaders arguing risk must make a return for growth. A year after the bailouts of Fannie Mae and Freddie Mac and the implosion of Lehman Brothers, more than 1300 business and government leaders met in Dalian for the "Summer Davos" of the World Economic Forum. Discussions on the dais and on the sidelines of the event swirled around when economic recovery will occur, what shape it will take and what leadership is required. "We have to look in the mirror ... and see that what is in front of us is very different from what we see in the mirror behind us," said Ben J. Verwaayen, chief executive officer of Alcatel-Lucent. Based on interviews and comments of top business leaders at the event, the winners of the new economic order will be leaders who move fast, are transparent in process and take advantage of the economic upheaval to sprint ahead of the competition. "Many households (brand) names were started in a times of crisis -- GE was started during the long depression in 1876; HP at the tail end of the Depression, FedEx during the oil crisis," said Vivek Ranadive, chairman and chief executive officer of U.S. software maker TIBCO. His advice: "Fail fast -- try something, and if doesn't work, move quickly to something else." But most leaders fail to look at strategy, and instead focus on survival. "Remarkably in a time of recession ... when you would expect decision-making to increase in speed it actually slows down," said Pramod Bhasin, chief executive officer of Genpact, an India-based technology outsourcing company. "Companies get paralyzed ... it demonstrates a lack of leadership." Adds Sir Martin Sorrell, group chief executive officer of WPP Group, the advertising and marketing giant: "The instinctive reaction in a recessionary environment is to cut costs. You can't cut your costs to growth and recovery." Regaining and building an economic foothold means regaining the confidence of the consumer, which is no small task. "Millions of people have lost homes, lost jobs, lost a large share of their wealth ... they have lost their belief in capitalism," said Maurice Levy, chief executive officer of the Publicis. "There will be reset of the values ... we should not waste the crisis, we should not waste the opportunity to transform the company and the world." Business leaders should use the financial crisis as a time to shake up long-standing problems within a company. "It's hard to convince people to change when things are going well," said Ranadive of TIBCO. "In some ways it's easier to manage (in a recession) ... Expectations are low, so it's easier to exceed expectations." The most difficult challenge for industry leaders will be to regain a spirit of ambition even as the economic recovery remains uncertain. James Schiro, group chief executive officer of Zurich Financial Services, said there is a feeling boardrooms that you can "combine being risk-free with innovation and an entrepreneurial spirit. That's impossible." "Risk, as long as you understand the risk, is a necessary integral part of doing business," added Verwaayen of Alcatel. "If you eliminate risks, you eliminate growth."